The change I need for my life exists for a reason. Discomfort pushes me to move from where I am to where I know I should be. Discontent prods me to step away from this moment into the possibilities of another. I look around and wonder if change is even possible for my life. 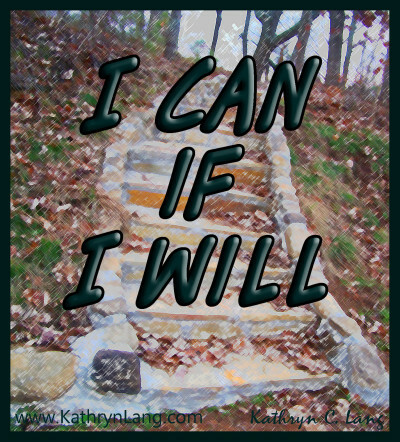 I can – if I will. I can do whatever I set my heart on doing – if I am willing to invest what it takes to see it through. Getting there will require that I make choices and some of them may be tough. Reaching my destination will require that I take action because action is always what drives me down the path of my journey. But I can – if I will. The struggle for me comes in the will part. I want something, but I am comfortable in my current place. There is not enough motivation or momentum to push me past this moment. I am settled in this moment – but it would be nice to be in that new place. My desire has not yet grown enough to overcome my complacency – and until that moment arrives, I will be settled in my current place. It is me – it is all me. I am the only one hindering my forward movement. Although my circumstances can make things difficult, they are not enough to stop me. Although the people around me can cause a lag in my progress, they are not enough to keep me from going on. Although problems can place barriers in my path, they are not enough to deny me my purpose. I, alone, hold that power. I am the only thing that can keep me from reaching the desire of my heart. 1. I am afraid of failure. What if I try and I mess up? What if I step out and I fall down? What if jump out and discover there is not a net? All of these things are possible – and often times they are probable – but the only true way to fail is to not try. Everything else – the mess ups, the fall downs, the missing nets – are just learning experiences that expand my reach and grow my opportunities even more. 2. I worry about what others will say. People are going to talk about you so accept that I do what you desire despite that. If you move forward, there will be some that talk because of your progress. If you move back, there will be some that talk because of your backsliding. If you stay put, there will be some that talk because you are not moving. It is the nature of the beast to talk, to complain, and to try to tear down. You will never please people, so pursue your own heart. 3. I am unsure of my direction. Uncertainty can be the part of any journey. You have the map. You have studied the map. And then a fork comes up in the road and suddenly you are no longer certain about the map. When that indecision overwhelms, you have three choices – take a small step in one direction and review the results; take a step back and review the map once again; stay put. The best way to reach the destination is with movement – so move forward or move back to a place of certainty before moving forward. If I want things to be different in my life then I have to make the choices that will lead to that difference. I am the only one in the way. I am the only one that can stop me. I am the only one that can make my desire a reality. Join me and John Michael Morgan as we talk about change on the CWA Network broadcast of Growing HOPE radio.